You're in the middle of a game of Ixalan Limited against Merida. Some creatures have traded, things have gone back and forth, and you find yourself here. You're each at 10 life. You have just cast a Territorial Hammerskull. 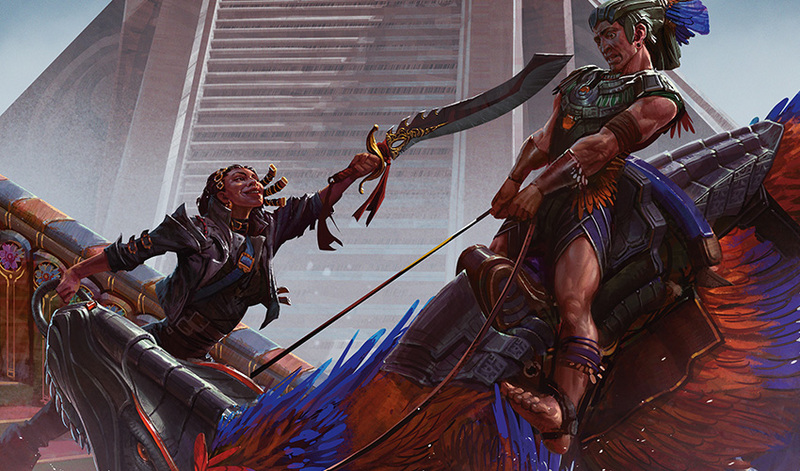 You pass back to your opponent and, on an empty board, she casts Nest Robber—and attacks. She has two cards in her hand. So, what do you think? Yes, I'm sure you'd like more information about your deck—but given what you've seen here, do you block? Have your initial answer? Great! Now, read on. 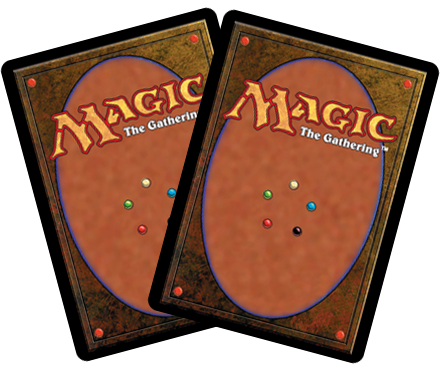 This is a situation you are going to stare down again and again in games of Magic. In Limited, Standard, Modern, and sometimes even Commander, you'll ask a simple question—do they have "it"? Merida is attacking her smaller creature into your larger creature. Either that means she made a mistake (and you should usually not assume your opponent made a mistake) or that she is trying to do something tricky. Why would she do that? Sometimes, the simplest path to the answer is the correct one. Your opponent is attacking into your larger creature. Why would they do that? Well, if they could off your creature in combat, of course! It's worth noting that there are two possibilities here: a pure combat trick or a burn spell. One potentially keeps their Nest Robber around because it makes it larger, the other just serves to finish off your Dinosaur. So they definitely have a trick if they're making this attack, right?
. . . Of course, it's exactly that line of thinking that could lead you to not block! Taking 2 points of damage is a full fifth of your life total at this point, and if Merida thinks she can sneak in 2 points of damage, she should go for it. The Robber certainly isn't blocking thanks to the Hammerskull's ability, so why not try and use it for 2 damage? There's one more wrinkle to consider too beyond just bluff or not bluff: what if Merida was trying to turn on another ability? Like, say . . . raid? This is a key one here, and part of why I wanted to discuss this topic now in the first place. There might be no trick. It might be no bluff. It may just be a chance to get value out of a raid card Merida has been holding onto. Losing that creature is worth activating raid here—and if you don't block, that's even better for her! Raid is one example that makes sense given Ixalan, but this can come up in many other says. From turning on a Scavenging Ooze to activating morbid, there are many reasons this could come up. So now that you understand your opponent's potential reasons for making this attack, it's time to think about what happens in each situation. 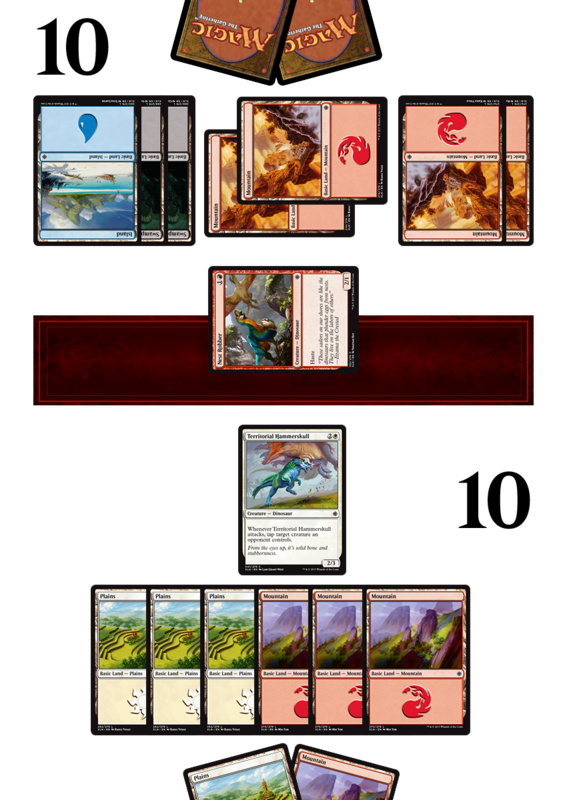 If you block, there are three likely outcomes here: your Dinosaur ends up taking down that Nest Robber with no downside to you (yay! ), your Dinosaur ends up trading with her creature and a removal spell (totally fine! ), or she has a big enough pump spell and you lose your Dino (boo!). If you don't block, then you're taking the surest outcome of 2 damage. You're essentially trading life for mitigating risk. That doesn't sound so bad. But here's the counterargument. It's very important, and a core concept to situations like these: that combat trick doesn't go away. It's not like by not blocking, magically that theoretical combat trick vanishes. It's still very much there. When Merida attacks next turn, are you going to block then, or will you still be worried about the combat trick? If you don't call her trick now, what are you going to do about it? You could argue here that you're just going to attack back, but you aren't ahead in this race—and a pump or burn spell will likely just cause her to have an additional advantage in the race long-term. As far as raid goes, she's getting it either way if that's what she wants from this attack. The only aspect of raid to take into account is what specific contextual raid cards might cause trouble here. And speaking of context . . . There are two big pieces of context to account for: format context and game context. The first is to look at the format. If you're playing Standard and you have a really good idea of what Merida's archetype plays, then you can take that all into account. In this case, you're playing Ixalan Limited, so you need to be thinking of Ixalan cards—and really, commons and uncommons. She has access to blue, red, and black mana. What could she have? Skulduggery would be rough, whereas Dinosaur Stampede would be acceptable since you still trade. Costly Plunder could be a reason why you should block—she's just trying to get a free 2 points of damage before sacrificing her creature anyway! Merida gets the raid trigger regardless, so you're mostly safe not worrying about it . . . but not with this card. If you don't block, this is an extra 2 damage to the face. If you do, then your Dinosaur is going to bite the dust. And this leads us nicely into game context. Have there been opportunities to play a Storm Fleet Arsonist or Skulduggery before? If she had a good chance last turn and didn't cast either, then she probably doesn't have one. On the other hand, if she hasn't had a good window for a combat trick all game, then it's likely she has one now. If this is Game 2 or 3, what combat tricks did she show last game? That can be good information for this time around. Has she kept playing lands or not? If not, that could indicate her hand is mostly spells—and if she didn't play a creature last turn, well, that's leading. Looking at it from your angle, another question is how much you value the creature you're risking. If it were a Bishop of Rebirth, you would really want to keep it on the battlefield and you wouldn't want to risk blocking if you could avoid it. If your red-white deck somehow had a Desperate Castaways, you probably wouldn't care as much about blocking. This can change from situation to situation. Another important factor can just be how you've played so far. In Game 1, were you hesitant to block before? Well, maybe she's happy to attack into you knowing that this time. What's in your deck? If your deck has mostly large creatures at this point, maybe you're okay offering up your creature because you just need to survive to draw your gigantic Dinosaurs. And then there's the fact you have two cards in your hand. Going one level deeper, Merida probably noticed you have two cards in your hand. If her plan is to combat trick and you have a removal spell of your own, that's a blowout in your favor. On the other hand, maybe she used some of these same processes to deduce that you have no trick. How much information have you given away? There are all these disparate elements to take into account. That's a lot to take in about this one situation, let alone to process in the 10 seconds between her attacking and you needing to decide what to do. So, what would you do? And is it different from when this article started? If it were me here, I'd block. Now, here's the weird thing. I think it is very likely she in fact does have something to make this attack good for her. In a situation like this, it doesn't look like a place where you can just risk throwing cards away. And if you had nothing, why not wait a turn until I've attacked and then surprise me with the 2/1? If she does have the Pyromancer, losing the Hammerskull is too bad, but that gives me two turns to draw a blocker instead of being at 4 life and facing down a 3/2 and a 2/1. That's a lot of thinking for one attack—but it's in one attack like this that games can be won or lost. The process discussed here can be applied for any kind of similar situation, for any format. Assess the whys of what your opponent is doing, evaluate them from your perspective, and think through the context. That should give you the information you need to make a strong decision. So much for a "simple" question! What do you think? There are fine arguments on either side for blocking or not blocking. Agree? Disagree? Let me know! You can always reach me by sending me a tweet, asking me a question on my Tumblr, or emailing me (in English, please) at BeyondBasicsMagic@Gmail.com. I'll be back next week with more Beyond the Basics. Keep having fun with Ixalan, and I'll talk with you again then!